These are just a basic vanilla muffins done gluten and diary free. Add in what you want and make them special. These are particularly yummy with berries, peaches, or cherries. Or go wild and use chocolate chips instead of fresh chopped fruit. Yum! These aren’t super “healthy” muffins (but really, what muffin is? Tee-hee!) but they are a great special day snack and delicious for a brunch. 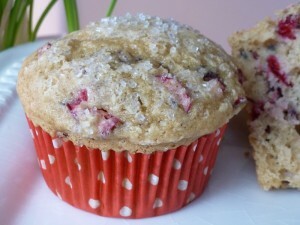 Edit: Here is a pic of the muffins made with slightly more sugar and fresh chopped cranberries that I posted on Once a Month Mom. Enjoy! Preheat oven to 350 degrees F. Line muffins tim with cupcake liners. Set aside. In a mixing bowl which the dry ingredients together. Mix in the wet ingredients (except fruit) until batter is smooth using a mixer. Do not over beat. Fold in fruit. Fill muffin tins 3/4 full with batter. Bake for 20 – 25 minutes at 35 until muffins are baked. Check with a toothpick or thin sharp knife to see if batter is baked through. Cool muffins on a wire rack.